The Brunson 76-RH Telescopic Transit Square is the Big Dog in Optical Tooling Transits. By making the main telescope's axle hollow, Brunson was able to mount a second telescope exactly 90 degrees to the main telescope. This telescope is focused at infinity. This 76-RH is fresh out of Brunsons Calibration Lab, and comes with their Certificate of Calibration. Magnification of the Main Telescope is 20X at 2 inches and goes to 30X at infinity. This has a one-degree Field of View and provides an Erect Image. All Optics have low-reflectivity coatings. 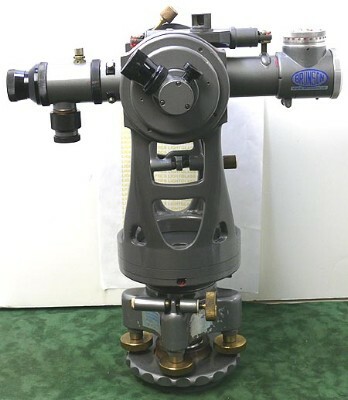 This includes the standard accessories- a 190 optical micrometer, a model 500 illuminator, and 194-TM Coincidence Level, as well as having the optional 192 Auto Collimation eyepiece installed. Fedex Shipping available if you need it FAST! These are completely gone through by Brunson and include a new case, illuminator, manual and calibration certificate!